People are always talking about not having to reinvent the wheel, but what if the purpose of the wheel changed? It's an admittedly rough analogy to what Razer has done, which is try to reinvent the mechanical switch. According to Razer, all mechanical switches up to this point have been designed for typing, whereas the new Razer Mechanical Switch was purpose-built for gaming applications. "Instead of focusing solely on typing comfort, as traditional mechanical switches have done, we had to completely rethink the conventional approach behind the actuation and reset points of mechanical switches in order to fine-tune them for gaming," says Min-Liang Tan, Razer co-founder, CEO and creative director. ""Our engineers' focus for the specification was on speed, accuracy and durability to bring the unfair advantage to gamers worldwide. The new switch makes the most popular gaming keyboard in the world even better." 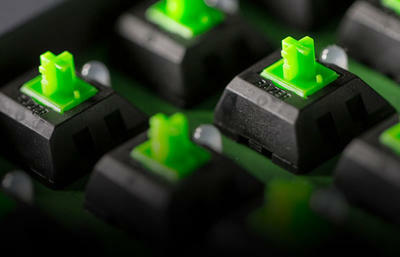 There are lots of mechanical switch types out there, though Razer contends its own is a different breed. How so? According to Razer, its team of engineers were able to identify the optimal actual distance for a gaming switch to a fraction of a millimeter, and they reduced the distance between the actuation and reset point by almost half, for faster and more precise gaming commands. Razer built two types of switches — the Razer Green that is tactile and clicky with a required force of 50g to actuate, and the Razer Orange that is also tactile but silent, requiring a force of 45g to actuate. Both types are available on the new Razer BlackWidow family of mechanical keyboards. Razer's also making the switches available to third-party peripheral makers.